The sun begins to set in Boracay, voted as the World’s Best Island in 2012 by readers of the prestigious Travel+Leisure magazine. BORACAY Island in the province of Aklan consistently rates as one of the best beach destinations in the world. Last year, tourist arrivals were expected to have reached 1.2 million despite the unofficial ban on Chinese group travels. South Koreans continue to account for the largest group of foreign tourists in the island paradise, but the bulk of visitors are still domestic tourists. So I find it incredulous when I meet, as I have over the last couple of years, new friends or acquaintances who have yet to swim in the island’s cool clear waters, or wiggle their toes in its powder-white sand. I’ve always thought that if one must travel outside one’s provenance for leisure for the first time, Boracay has got to be one’s first destination, or at least on the top list of go-to places in the country. And with the stiff competition among local carriers driving down airfare, one no longer needs to spend a humongous amount of funds just to fly to Boracay, and enjoy the many pleasures it offers. There is also an overwhelming number of choices of accommodations for every type of tourist—from the seriously bare one-note cottage that attracts the backpacking set (usually at Station 3), to the high-end-$1,000++ a-night villas that exude luxury for the pampered leisure traveler (Station 1). 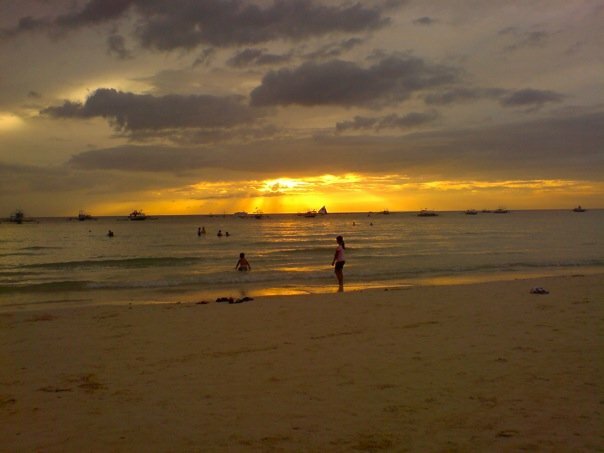 And if you have a phobia of crowds, this is absolutely the best time of year to go to Boracay. The air is chilly especially in the morning, and while the sun is usually out, the heat is quite tolerable. The beaches. While the 4.5-km stretch of white beach is the main attraction of Boracay, and is the central area where revelers sunbathe and hang out before taking a swim, there are other beaches on the island that are worth a look-see. The main white beach of Boracay is famous the world over as one of the best beaches in the world. Bulabog Beach is every windsurfer or kiteboarder’s paradise, with strong winds from January to June encouraging amateur and professional competitions among locals and visitors. From the main white beach, one can reach Bulabog by crossing to the opposite side of the island via several pathways. For amateur spelunkers and wildlife enthusiasts, Ilig-Iligan Beach is a good place to explore caves and see fruit bats hanging from trees. Located on the east coast of Boracay, the beach is accessible by motorbikes or on foot although the hike will probably take about 30 minutes or longer, depending on one’s pace. It is also a favorite among snorkelers. The mountain. To further appreciate the beauty of Boracay, one can rent an ATV or motorbike and drive to the top of Mount Luho. It is the highest point on the island and will reward the hardy trekker with stunning views of the island and the surrounding sea. There is a viewdeck, a mini-zoo, as well as zipline that will please both the animal lover and the thrillseekers. There is an entrance fee of P60. The mall. Or D’Mall as it is called on the island. This is ground zero for the enthusiastic shopper. Here there are a hundreds of sarong (the tie-died and batik varieties) to choose from, as well as the gamut of native handmade jewelry, bathing suits, souvenir T-shirts, even furniture and home accessories. The spot is also famous for bars and restaurants offering a variety of international and local cuisine although the entire white beach is riddled with numerous restaurant and café choices to please even the most discriminating of palates. Swim like a mermaid. Indulge your fantasy and get a workout as well—mermaid swimming offers tourists a fun way of keeping fit. Two-hour swimming lessons are conducted at Ti Braz restaurant between Stations 1 and 2, and yes, you do get to slip into a mermaid tail. Basic swimming skills are required. The classes are run by the Philippine Mermaid Swimming Academy, composed of expert swimmers and divers. Mermaid fitness workouts will soon be offered. (For bookings, check out https://www.facebook.com/PhilippineMermaidSwimmingAcademy/info). Gorge on seafood. Name it, Boracay has it. Whether you are hankering for lobsters or oysters, mud crabs or sweet shrimps, prawns as well as a variety of reef fishes, D’Talipapa assures that your favorite seafood is available at the most reasonable price. After buying your seafood, take them to any of the nearby eateries and for a minimal charge, have them cooked any which way you want, and enjoy a tropical feast. Though seafood is top of mind in beach destinations, Boracay is also home to some of the best international cuisines offering meat-based dishes and fabulous desserts. Some choice restaurants and cafés include Caruso (Italian) at The District along Station 2, Kasbah (Moroccan) at Station 1, Lemoni Café at D’Mall for the best lemon tart. Seafoods are aplenty at D'Talipapa. You can buy them and have them cooked at the nearby restaurants, or in this case, order them at Sun Villa. It’s one of the most beautiful beaches I have ever seen. Your pics show that you had a lot of fun during your trip in Boracay. I will also try to go there and have an enjoyed trip.